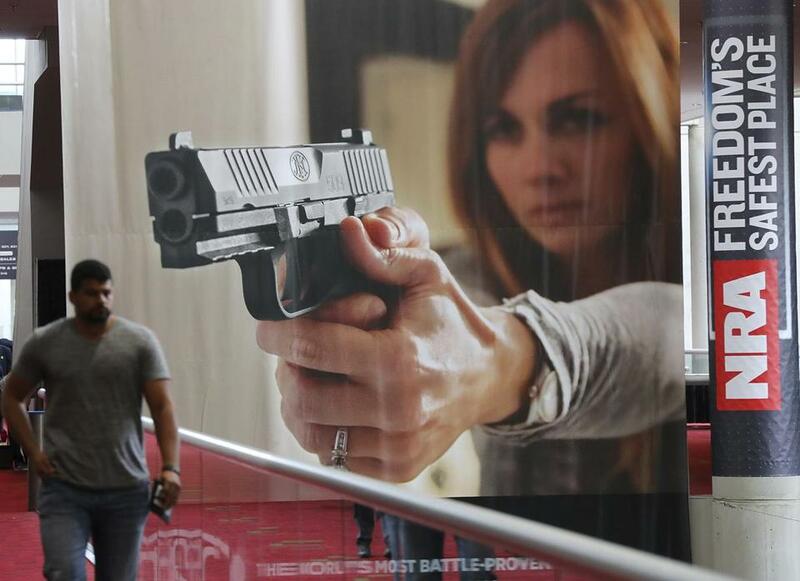 An attendee passes by a large banner advertising a handgun during the National Rifle Association convention at the Georgia World Congress Center in Atlanta in April. Jim is a 77-year-old conservative from Arizona. A lifetime member of the NRA, he got his first gun — a .22-caliber rifle — at age 7, when his grandfather decided he was old enough to learn about safety. He has owned guns ever since, and regularly takes target practice at a gun club. When Jim thinks about the shooting in Las Vegas, he tells me he believes we must get a handle on mental health, and that 99.9 percent of gun owners are not crazies. “All of this said, our gun laws need significant improvement,” Jim starts. “How about removing bump stocks from existence? Or requiring background checks on all gun show buyers?” Jim continues with detailed recommendations about mandatory waiting periods for gun purchases, regulations for ammunition sales, and more. In my ongoing research with voters, there is significant common ground on gun control. Over 80 percent are supportive of additional regulation. Across the political spectrum, voters agree with Jim on universal background checks, waiting periods, and banning sales of guns to people convicted of a violent crime, and much more — and this is supported by a recent national poll by Quinnipiac University. Unlike other issues I discuss with voters, the differences in their views about guns are more about personal experience and less about political affiliation. Their perspective depends on whether they live in Gun Country. Gun Country is defined neither by whether their state is red or blue nor about whom they voted for in the presidential election. It’s more about their own community. As in all public health problems, we can’t change behavior, but we can change the product and the environment in which it is acquired. Voters outside of Gun Country denounce America’s gun culture. They are concerned about America’s 300 million guns, the media glorification of violence, and the number of children who get shot every year. They question why anyone would ever need an assault weapon, and are especially negative about Congress’s resistance to any legislative changes. While they don’t necessarily believe that gun control would prevent mass shootings, they think it is a critically important step. Most want to close gun show loopholes, but have not been to a gun show; they want to ban assault weapons, but make no distinction between semiautomatic and automatic weapons; and they strongly support mandatory waiting periods for gun purchases, but would never actually buy one. In Gun Country, it’s different. In Gun Country, they also talk about having guns for protection in places where police aren’t close by. Having a gun is like buying a home security system or a fire extinguisher. So when they talk about gun control laws, the conversation is more specific and technical. Across the political spectrum, voters agree on universal background checks, waiting periods, and banning sales of guns to people convicted of a violent crime. Why doesn’t all of this support lead to progress on gun control legislation — or at least to restoration of the ban on high-capacity magazines and assault rifles championed by Ronald Reagan? Because of what Gun Country voters hear from the NRA. The NRA spent $50 million in the last election to make sure members knew that that “Hillary wants to take away all of your guns.” Wayne LaPierre, the head of the NRA, famously told his membership that if the Democrats gain control of the government, “you can kiss your guns goodbye.” Voters in Gun Country talk about a barrage of phone calls, postcards, and flyers from the NRA, explaining that Democrats are scheming to prevent the average private citizen from owning guns at all. The message from the NRA gets reinforced by anti-gun politicians on the other side who throw around terms that Gun Country sees as incorrect or misleading, such as using violent crime statistics in Chicago and generalizing them to the rest of the country. The result? Voters feel that the NRA may be overzealous, but that ardent advocates of increased gun control are completely out of touch with the culture of civility and responsibility that is part of their community. For the people of Gun Country, as long as the NRA and the anti-gun extremists own the conversation, nothing can change. Instead of shared interests, we get a meaningful divide that doesn’t need to exist in the first place. There is common ground on gun control. 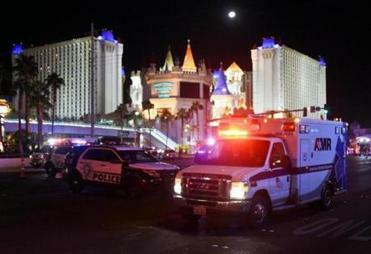 Americans in and out of Gun Country are disgusted and horrified by events such as Las Vegas, and agree that gun control is both important and inadequate in the face of those who have suffered. It’s time to listen to one another and make progress.